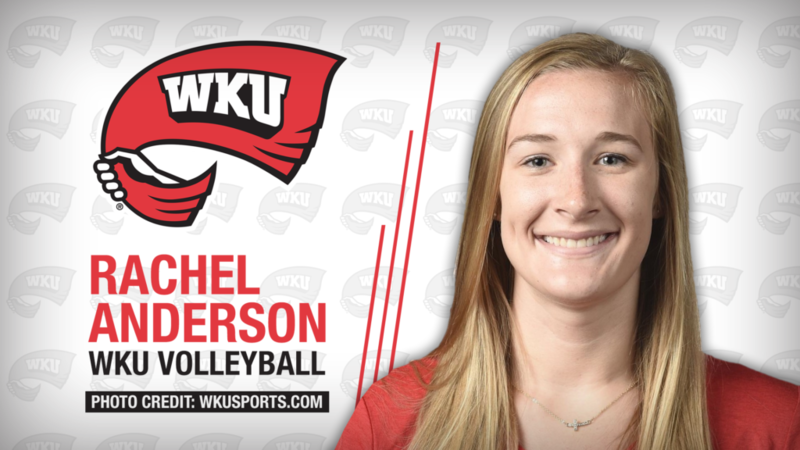 LEXINGTON, Ky. – WKU Volleyball senior middle hitter Rachel Anderson has earned her third-straight AVCA All-Region Team selection, the American Volleyball Coaches Association announced Tuesday. The Sturgis, Mich., native is one of just 18 current student-athletes across the country to earn at least three All-Region nods across their career and is one of just two players in the South region to achieve the feat. Leading the way for the Red and White, Anderson notched 397 kills across her final season while operating at a .346 efficiency. The three-time All-Conference USA selection was just as effective on the defensive side as well, owning 113 total blocks on the season – including 37 solo stuffs. Anderson owns the third-most blocks by a Lady Topper in program history with 442. Back in August, the middle hitter was tabbed the Conference USA Preseason Player of the Year and was later on selected as a Senior CLASS Award Candidate. Anderson led the Red and White in kills 20 matches this season and in blocks 17 times. With 1,457 kills across 134 matches during her career with the Red and White, Anderson ranks sixth on the all-time kills list at WKU while her 3.05 kills per set rank eighth. Anderson’s .377 career hitting percentage sits second all-time behind only Megan Argabright’s .382. At the net, Anderson’s 95 solo blocks rank fourth while her 347 block assists rank second overall. Anderson is one of just three Lady Toppers to ever achieve 400 blocks during their career. Across Anderson’s four seasons on The Hill, WKU Volleyball sported a 113-21 record that included six collective Conference USA Championships. The Lady Toppers went 53-5 in C-USA regular season play during Anderson’s career.